IDW teams with Boom Studios for a pairing of classic science fiction properties. This one is very, very different indeed. There isn’t a ton of story info as of right now, but Captain Kirk and the original crew of the Enterprise somehow find themselves on the Planet of the Apes, facing off against a group of Klingons who are backing a renegade faction of Apes. How exactly all this comes together (especially figuring the conventions of both universes) should be interesting to see to say the very least, but it does sound pretty awesome, especially if you’re a fan of some of the best sci-fi of all time. IDW and Boom are promising all the characters you know and love for this one, as well as Klingons on horseback, brandishing rifles. What’s not to like? 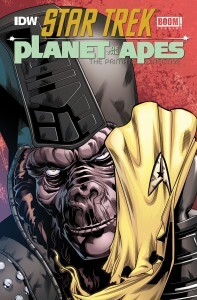 Stay tuned, Star Trek/Planet of the Apes will be hitting comic shops sometime soon.